Guardian Group has set out on a path of automation. As a leading insurance company in the Caribbean, the financial firm sees this strategic shift as essential to improving its current services and setting the stage for ongoing expansion. Established, successful firms, particularly those in the financial world, can be resistant to change. But the writing was on the wall that technology is the way forward. So while the company did not leap before it looked, the early results of its foray into the world of automation convinced those at the top to get on board. Almost immediately after seeing the real-world power of automation and robotics, the insurer became receptive, according to Ravi Tewari, group chief executive officer of Guardian Holdings Limited. Guardian Group is the largest provider of insurance services in Trinidad and Tobago and has a market-leading presence in 21 countries throughout the Caribbean. The insurer, whose history dates back nearly 170 years, offers coverage lines including life, health, property, and casualty in addition to products and services in areas such as asset management and bancassurance. “We are by far the largest player in Trinidad and Tobago, we’re number two in Jamaica, and we are one of two major players in the Dutch Caribbean,” said Tewari. Nearly 60% of the company’s roughly $800 million USD in revenues last year came from Trinidad and Tobago. This is in large part due to the size of the market — the biggest in the English-speaking Caribbean — as well as the company’s long history on the islands. Guardian Group says it now controls some 60% of the new business written in the nation’s life market and holds a roughly 30% market share in both the health insurance and property and casualty lines. As it attempts to further consolidate its market dominance in the Caribbean, the company also has expansion plans. For the next stage of its development, Guardian Group has its sights set on moving into other countries surrounding the region. Beyond that comes even grander ambitions — and it sees automation as critical to reaching these goals. In 2017, financial services firms that want to remain on the cutting edge must become lean, mean, and efficient. The phrase “digital transformation” has become something of a buzzword, but Guardian Group is taking its evolution very seriously as a driver of competitive advantage. The company’s primary objective is to free up its experienced workforce to provide higher-level services to its clients while automation handles the rest. “The underlying philosophy is that we will let humans do the meaningful stuff — like customer interaction and the judgmental tasks — and, in effect, let automation and software robots do the repetitive work,” said Tewari. In the insurance business, there is a lot of low-hanging fruit when it comes to automation. Guardian Group has already implemented some changes, and higher-level applications are now coming online as the seeds from its overhaul project with the Rochester, New York-based Sutherland Global Services start to bear fruit. The first aspect of automation the company deployed was a front-end system for cashiers that allows them to handle all lines of business. Previously, cashiers were assigned by line of business and lacked a total view of the customer. This framework became overly complex and challenged the customer service experience. Having old systems is par for the course in the insurance industry. Legacy systems, disparate dashboards, and ad hoc workarounds abound due to the large number of mergers and acquisitions in recent decades. Trying to integrate everything into one system has usually been deemed more of a hassle than it was worth. But that has changed. The technology that exists today cannot be ignored. Modern brute-force processing capabilities and intelligent software mean that a strategically sound investment can add a host of benefits that were previously unattainable no matter how much was invested. Efficiency and process gains are there for the taking if the company is willing to walk down the sometimes-treacherous path toward digitization and automation. Despite the obstacles, waiting was not an option. On top of the internal gains that the company wanted to achieve, it also sees insurance consumers becoming increasingly sophisticated. Its clients are now demanding a very high level of service, and this trend is only gaining momentum. “The pressure to do something about our system was coming from a number of angles,” said Tewari. Guardian Group knew that its automation plans were too big to tackle alone. While Sutherland Global isn’t a household name, aligning with the firm has been a perfect fit. 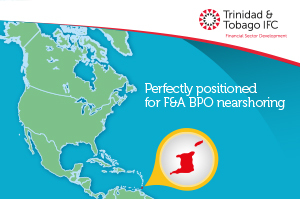 This global process transformation firm was introduced to Guardian Group by the Trinidad and Tobago Financial Centre (TTIFC), which recognized the match between Sutherland’s experience transforming financial services firms and the company’s need to digitize its work processes. Given the U.S. firm’s history of providing business transformation, cloud services, and robotic process automation work for diverse clients, Guardian Group felt it was the right choice and has been encouraged by the results so far. Sutherland also has a host of experience working with banking systems and loan servicing upgrades, “Know Your Customer” (KYC) enhancements, and business process outsourcing (BPO) services. Guardian Group knew its systems were behind the times and has been receptive to the upgrades that Sutherland believed would be the quickest and most efficient route to achieving the insurer’s goals. On top of this, the two have worked together to integrate automation improvements with process re-engineering and sophisticated data analytics. The journey is still in its early days. “In terms of results we are about 10% done,” said Tewari. “But in terms of the work to deliver, we are about one-third done.” While that leaves a long road ahead, he is confident that automation can be embedded throughout the company — across all lines of business and locations — by early 2019. “In two years’ time, we expect this to look like a completely different company,” he said. While part of Guardian Group’s motivation to modernize came from a fear of being left behind, the transformation is also about capturing opportunity. Jumping on the vanguard will open up new possibilities, and the group CEO sees this as particularly true for anyone operating in the Caribbean. Scaling is a constant challenge in the region. While there are appealing markets in various countries — not only in Trinidad and Tobago but in larger cities like Kingston and Nassau — it is a different animal from trying to expand in the United States or Europe. Capturing the larger markets means operating not just in different countries with different regulations but on different land masses. The geography of the islands in the Caribbean presents unique challenges. Technological advances, however, are easing this burden. Now, through automation, benefits achieved in Port of Spain are much more easily replicable in Curaçao and Antigua — or in the larger capital cities in Central America. With robotic process automation efficiencies coming onboard and a more digital focus, Guardian Group can be more confident about its push into these other markets. In that respect, Guardian Group couldn’t be more pleased with its decision to move in this direction. Not only has it viewed the strategic decision as essential, but because it is already ahead of many others on this automation journey, this is something the company thinks will further cement its leading position in the region.